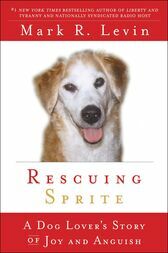 From the New York Times bestselling radio personality Mark Levin and his family comes the true story of the two years of joy and anguish they had with a rescue dog named Sprite. Mark Levin, while known as a lawyer and nationally syndicated broadcaster, considers himself first and foremost a dog lover. In 2004, Mark’s family added a new member to their bunch—a beautiful, Spaniel-mixed dog they named Sprite. With his beautiful face and soft, huggable fur, Sprite immediately bonded with the Levin family. But on Halloween night, just three weeks after being adopted, Sprite collapsed and had to be rushed to the animal hospital in what would turn out to be the first of many such visits—and a difficult, heart-wrenching journey for the entire family.